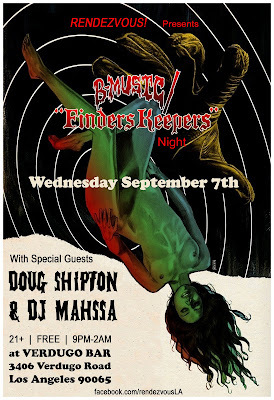 ::: DJ ALFONSO'S MUSIC CABINET :::: B-Music/Finders Keepers Night with Doug Shipton & DJ Mahssa!! B-Music/Finders Keepers Night with Doug Shipton & DJ Mahssa!! Join us on Wednesday, September 7th for the return of B-Music/Finders Keepers to RENDEZVOUS! This go 'round we are honored to host Doug Shipton & DJ Mahssa!! We can't wait to hear what unfashionable sounds this Dedicated Swallower of Fashion will be spinning. Also, look for giallo & sleazy freak films to compliment the tunes on the big screens! PLUS late night eats from a delectable food truck!